Do you know that around the world, followers of Christ are suffering and dying because of their faith? As a matter of fact, at least 200 million Christians worldwide regularly endure persecution. Tragically, many die by the hand of their persecutors. But you can bring hope, help, and healing to the persecuted and suffering church. And you can do this by uniting in prayer with Christians from across America and around the world on the International Days of Prayer, November 4, and 11. 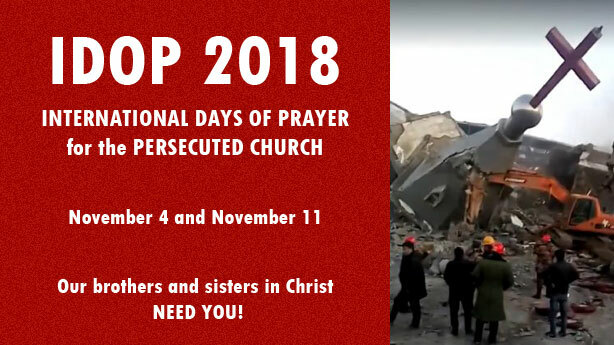 What are the International Days of Prayer (IDOP) for the Persecuted Church, and why do we need them? The International Days of Prayer are days on which Christians around the world join in prayer for persecuted followers of Yeshua (Jesus). For many Christians in the West, suffering for our faith is a foreign concept. Yet, for millions of Believers worldwide, following Yeshua (Jesus) could literally cost them their lives. Nevertheless, they remain strong in the Lord. To say that our suffering brothers and sisters in Christ need our prayers is an understatement. However, before we can effectively pray for them, we must know their stories. The following is the story of a Believer for whom denying Christ is unimaginable, no matter the cost. 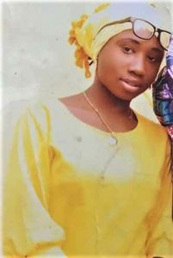 10/28/2018 — More than eight months have passed since Islamic terrorists kidnapped Leah Sharibu from her boarding school. Below is a timeline of events. 02/19/2018 — Late at night, Boko Haram terrorists raided a girl's boarding school in Dapchi, in the northeastern state of Yobe, Nigeria. Then, with guns blazing, the militants rounded up and abducted 110 schoolgirls. Included among the captives was 14-year old Leah Sharibu. Tragically, five of the girls died on the way to the terrorists' hideout. 03/21/2018 — After negotiations with the government, the jihadists returned the surviving girls to their school, with one exception. They refused to release Leah Sharibu, the only Christian in the group of Muslim schoolgirls. The terrorists demanded that Leah renounce her Christian faith and convert to Islam before they would release her. However, Leah steadfastly refused to deny Christ. After learning that Leah turned down the chance for freedom, Leah's father said he was “very sad, but also jubilant because my daughter did not denounce Christ”. Upon returning the captives, the Boko Haram insurgents warned their parents not to allow the girls to attend school. As of this writing, the school remains empty. 05/14/2018 — Leah Sharibu spends her 15th birthday in the hands of Boko Haram extremists. Instead of celebrating, Leah's mother is crying while her father asks for help to get his daughter back. Meanwhile, Christian groups in Nigeria and from around the world join in marking Leah's birthday by praying and working together for her release. 09/17/2018 — Boko Haram released a video showing the execution of a Red Cross aid worker. The victim was one of three humanitarian workers abducted on March 1 by the Islamic radicals. In the video, they also demanded ransoms within the next month. Otherwise, they will not only execute the other two aid workers but will also murder Leah Sharibu. 09/29/2018 — Leah Sharibu's mother makes an impassioned plea for the release of her daughter. Please sign the following petitions. ACLJ: Sends Letter to Nigerian Ambassador Demanding Action to Free Christian Teen Leah Sharibu and Protection for Nigeria's Endangered Christians. CSW: Send an email to the Nigerian High Commissioner urging the Nigerian government to secure Leah's release. Pakistan , the world's third largest Islamic nation, ranks at number five on the World Watch List. Less the 2% of Pakistanis self identify as Christian. And for them, every day is a struggle just to survive. To learn about what Christians in Pakistan undergo, watch the video below. Please sign ACLJ's urgent petition to Save Asia Bibi from Execution before the court releases its verdict. Asia Bibi is asking for prayer, while angry Islamist radicals demand her death and threaten violence. For more about Pakistan, visit PrayerCast.com . The First and the Last, the One who was dead and came to life, says: "I know your works, tribulation, and poverty (but you are rich); and I know the blasphemy of those who say they are Jews and are not, but are a synagogue of Satan. Do not fear any of those things which you are about to suffer. Indeed, the devil is about to throw some of you into prison, that you may be tested, and you will have tribulation ten days. Be faithful until death, and I will give you the crown of life. Recorded in the Book of Revelation are letters to seven churches; representative of the Body of Christ. In addressing five of the seven churches, Yeshua (Jesus) warned them, over and again, to “repent ... or else”. Only two churches received no words of rebuke from Yeshua (Jesus). The persecuted/suffering church in Smyrna was one of only two churches able to stand blameless before the Lord Yeshua (Jesus). Though they were already in poverty, soon more trouble would come their way. Smyrna was a wealthy city; nevertheless its Christian population lived in poverty. Similarly, in many countries today, economic persecution forces Christians into abject poverty. To see where economic persecution could lead, all we need to do is look back to the not so distant past. When I look back in time to Hitler's Germany, I cannot help but see striking similarities between Hitler's persecution of the Jews and Pakistan's persecution of Christians today. For instance, Hitler's economic persecution involved restricting the industries in which Jews could work. Now if we fast-forward to modern day Pakistan, we find a similar situation. Pakistani Muslims treat Christians as though they are inferior to them. Consequently, they marginalize Christians and allow them to work only in “dirty jobs.” And recently, some newspapers have run ads for “dirty jobs” specifically for Christians; non-Christians need not apply. Oftentimes, Christians work in extremely unsanitary conditions and with no protective equipment. The economic persecution that Pakistani Christians endure today is eerily similar to what the Jews faced in Hitler's Germany. And as we all know, Hitler's persecution climaxed with the extermination of six million Jews. In light of the Holocaust, it is sobering to think wear Pakistan's economic persecution of Christians could someday lead. Even though the church in Smyrna lived in poverty, the worst was still yet to come. Yeshua (Jesus) also warned them of a coming wave of persecution they were about to suffer. Yeshua (Jesus) told the Believers in Smyrna that the devil would throw some of them into prison. But you must understand that when John wrote this letter, prisons were mainly used to hold prisoners who were awaiting execution. For the Christians in Smyrna, going to prison meant death. Did you know that in a growing number of Muslim-majority nations, conversion from Islam to Christianity is by law a capital offense? In other words, apostasy from Islam is punishable by death. Countries with an official death penalty for conversion to Christianity include Iran, Mauritania, Qatar, Saudi Arabia, and Sudan. Our brothers and sisters in Christ are suffering in 50+ countries around the world. And so I ask, on the upcoming International Days of Prayer, what will you do? Will you be an advocate for our persecuted brothers and sisters to the Lord God Almighty? If so, then continue reading on the next page for free and downloadable prayer resources. Also, find publications to keep you up-to-date, practical tips, and more.